Pro basketball returned to Seattle, ever briefly, on Saturday for the H206 Charity Basketball Classic at KeyArena, which featured a "Seattle vs. The League" matchup. While several of the world's best players were entertaining fans across the Pacific in Manila, a less star-studded pair of lineups hit the floor in Seattle, yet the approximately 5,000 in attendance were quite happy to see NBA players back on the floor at the Key. The Seattle roster featured Jamal Crawford and Terrence Williams from Rainier Beach H.S., Aaron Brooks from Franklin H.S., former Seattle Prep teammates Spencer Hawes and Martell Webster, Isaiah Thomas from Tacoma (and UW), O.G. Michael Dickerson from Federal Way, and Will Conroy from Garfield High (and UW). Brandon Roy and Rodney Stuckey were also at the game, but did not play. Meanwhile, two truly legendary Sonics in Shawn Kemp and Jack Sikma were on the bench as coaches of the Seattle team. The League team was something of a mishmash, headlined by Michael Beasley, a triumvirate of Warriors (Dorell Wright, Klay Thompson and Jeremy Tyler) and a pair of Duke rookies (Nolan Smith and Kyle Singler), plus a collection of backcourt flotsam (Pooh Jeter, Troy Bell, Corey Williams). 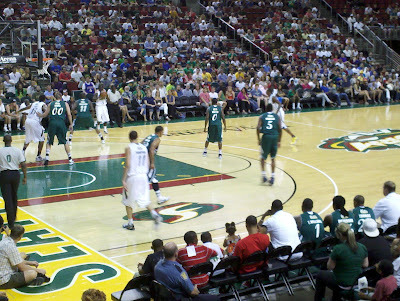 The Seattle team broke open the game in the second half to win 140-122, in a game that was a good show, and about as competitive as one would expect from a summer exhibition, as evidenced by the fact that Corey "Homicide" Williams, 2010 MVP of the Australian NBL, was the game's leading scorer with 29 points (I believe - going off of memory here, as there is no box score available). With that as a caveat, it was still interesting to see rookie big man Jeremy Tyler, who spent the last couple years in Israel and Japan, in action. As Bethlehem Shoals noted to me, one can understand how GMs would become enamored with Tyler, as he certainly looks like a potential NBA star. Tyler was very impressive physically, as a 6-11 center with good length and eye-catching athleticism, which he flashed on a couple windmill dunks. Tyler looked like he belonged on a couple post moves vs. Hawes, on plays where Spencer actually seemed to be defending, and the rookie also showed a decent shooting touch, though he also wasn't shy about tallying up the FGAs. Of course, it's a long way from summer charity games to the league itself, so there's nothing conclusive here, but my overall thought was that it's hard to believe Tyler slipped past the first pick of the second round (he went ninth in that round), where there is essentially no risk, because his upside seems so high - there can't be more than a couple guys in this year's draft class who are comparable physically. Persistent attitude questions are a main reason Tyler's physical stature far surpasses his draft position. My only other observation which may relate to actual NBA basketball, should we ever see it again, was that it was a bummer to see Brandon Roy sitting with his kids on the bench, rather than out on the floor, especially after he'd been one of the primary players seen on promotional posters for the game around town, though it certainly wasn't a surprise given his well-documented knee problems. Ben Golliver of Blazers Edge caught up with Roy, who turned 27 on Saturday, for CBSSports.com. Roy claimed that he skipped the game as a precaution, saying, "I'm healthy." I just wish I believed that. -- Steve Ballmer was a major supporter of the H206 game, and he looked quite comfortable sitting in the courtside seats once occupied by former Sonics owner Howard Schultz. When I arrived about 15 minutes before game time, the Microsoft CEO could be seen chilling outside the arena. 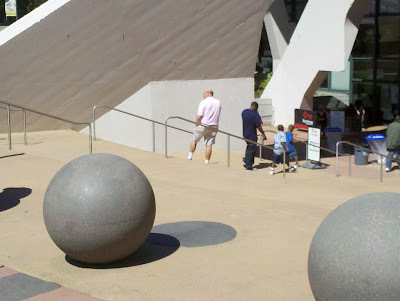 I saw multiple people walk by Ballmer and implore him to bring NBA ball back to Seattle. So much of the future of the NBA in Seattle really does seem to be in his hands. If there is an arena solution, I believe the NBA will return; if there isn't, I believe it won't. I also think it's unlikely that much, if any, public funding will be available. In many ways, it feels like the answer to the question "Will the NBA return to Seattle?" is dependent upon the question "Will Steve Ballmer fund an arena solution out of his pocket?" -- Jamal Crawford's game was really made for summer exhibitions. On multiple occasions, he dribbled through his legs as he skipped up the court, and one time he even went through the legs of rookie Klay Thompson off the dribble. All told, I felt like it wasn't dissimilar to watching Crawford play in high school. Fellow Rainier Beach Viking Terrence Williams also seemed well-suited for the event, winning the MVP after scoring 25 and delivering several highlight-reel plays. 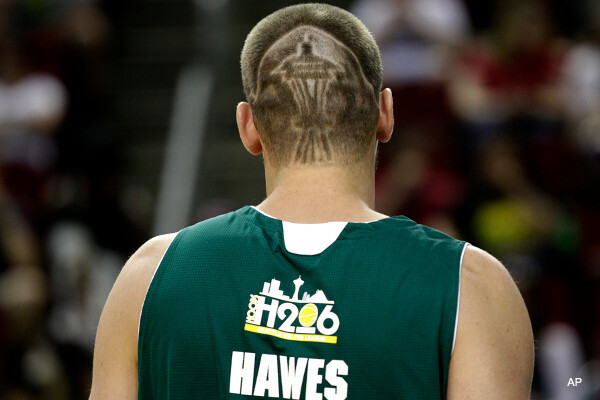 -- It's been well-documented by now that Spencer Hawes had a replica of the Space Needle shaved into the back of his head. The Sixer also led the crowd in a chant of "Come Home, Sonics" at game's end. -- The crowd of about 5,000 seemed promising for the first stab at a Seattle charity game, especially on one of the few glorious days of a dreadful summer, weather-wise. Hopefully, momentum can build for another game next year, with upgraded rosters including guys like Ray Allen and Rashard Lewis (who've voiced support for Seattle charity games in the past), as well as a fuller complement of Seattle guys, like Jason Terry and Nate Robinson, not to mention Sonics legends of the past, such as the impressive collection which is gathering for Sonics Appreciation Night at Safeco Field this coming Friday night. There are easily enough notables out there to even create a game with rosters composed entirely of players who are Seattle-Tacoma products and/or ex-Sonics. By the way check out the total information about the European Basketball Championship 2011,like rosters, teams, Eurobasket 2011 schedule, Dates, Fixtures, Eurobasket 2011 Rosters , Players, Eurobasket 2011 results and more from here European Basketball Championship 2011 . "If you haven't any charity in your heart you have the worst kind of heart trouble" to cure it Help people, let's unite for one good cause, be a volunteer"save lives"! I've been browsing online more than 2 hours today, yet I never found any interesting article like yours. It is pretty worth enough for me. Personally, if all web owners and bloggers made good content as you did, the net will be a lot more useful than ever before. It's the best time to make some plans for the future and it is time to be happy. I have read this post and if I could I desire to suggest you some interesting things or tips. Perhaps you could write next articles referring to this article. I want to read more things about it! Just want to say your article is as astounding. The clarity in your post is simply great and i could assume you are an expert on this subject. Yes! Finally someone writes about money magazine best banks. It's awesome to visit this website and reading the views of all friends on the topic of this post, while I am also keen of getting experience. page and thus far? I amazed with the research you made to create this particular submit amazing. I don't understand why I cannot join it. Is there anyone else getting identical RSS problems? Anyone who knows the answer will you kindly respond? Thanks!! I think I might by no means understand. It kind of feels too complicated and extremely broad for me. I'm looking ahead on your next post, I will attempt to get the grasp of it! Truly when someone doesn't be aware of afterward its up to other viewers that they will assist, so here it occurs. bothersome to inform the reality then again I will definitely come back again. these kinds of experience, therefore it's fastidious to read this web site, and I used to pay a quick visit this web site every day. Life's too mysterious to take too serious." 0818jejeLes escargots sécrètent Air Jordan Future Chaussures ce liquide sous tension pour réparer rapidement les dommages à leur peau baskets nike ou à leur coquille. Même ainsi, vous basket nike femme tn trouverez une légère variation des coûts autour des différents types nike air max thea jacquard w chaussures fournis. Beaucoup moins de douleur à l'intérieur de asics gel lyte v homme soldes l'approche pour guérir la maladie et d'autres effets chaussure homme nike sb blazer zoom avec de meilleurs résultats a conduit les gens boutique nike france paris à obtenir beaucoup plus de foi dans les sciences médicales air jordan 1 mid jaune modernes. Hall of Fame Candidates: What to do with Detlef?